Tuesday, December 3, at 6:00 pm. Junior Girls vs. Senior Girls in Flag Football. There will be a court this year with three seniors (Peyton Richards, Carter Holmes, and Connor Weissinger), two juniors (Purav Maisuria and KC Lucious), and (new this year) two sophomores (Nick Beddingfield and Robert Crisler). A “queen” will be crowned! The concession stand will be open with hot chocolate and cookie cake. 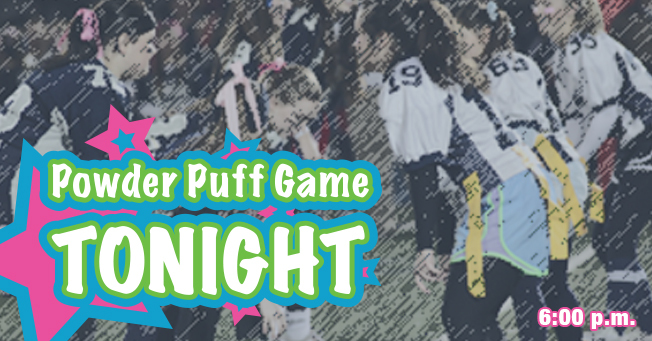 Admission is $5, but if you wear your Powder Puff T-shirt admission is free!